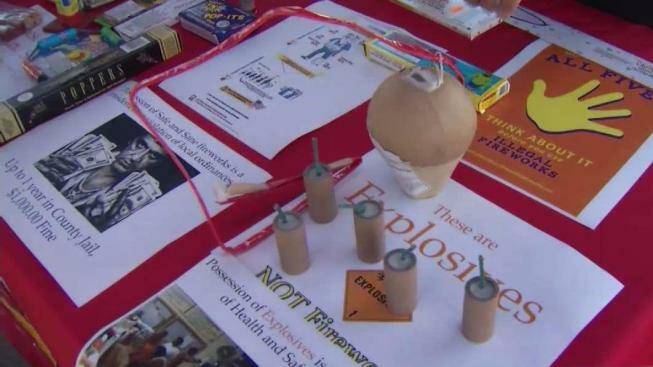 With the Fourth of July holiday just about one week away, emergency officials in the South Bay are reminding festive folks to play it safe when it comes to fireworks. Fire chiefs, medical professionals and even animal service representatives on Monday implored people to ditch personal use of fireworks in favor of professional displays during the Independence Day holiday. "We don't want you putting yourself, your children, your pets in danger and even causing injury or death," San Jose Fire Department Chief Curtis Jacobson said. Several professional displays in the South Bay are slated to light up the night sky from Cupertino and San Jose to Morgan Hill and Gilroy next Tuesday. Those options are much safer than risking injury or death by lighting off fireworks in neighborhoods. "I can't think of a worse way to spend a holiday than having one of my family or friends being injured using fireworks," Santa Clara County Fire Department Chief Ken Kehmna said. San Jose police will be on high alert in places where fires are more likely to spark. One of those areas is Kelley Park on Senter Road between Alma Avenue and Story Road. "We identified certain hot spots and are asking our patrol officers to do extra patrols in those areas," Capt. Johnson Fong said. San Jose police, in fact, recently confiscated 2,700 pounds of illegal fireworks. The suspects face jail time in addition to thousands of dollars in fines. Using, selling or storing fireworks in San Jose carries a $500 fine for a first-time offender, according to the city. That penalty jumps to $700 for a second-time offender and $1,000 for a third-time violator. City and county leaders hope that by getting the message out early and often, they can prevent injuries or other more serious tragedies. But despite warnings, increased patrols and significant penalties, authorities know some people will still shoot off illegal fireworks. Jill Sproul, the former head of the burn unit at Valley Medical Center has seen it many times before. "Every year at the Fourth of July, despite our prevention efforts, we still see people with fireworks related injuries, whether it's from a blast, sparklers or firecrackers," she said. Residents in San Jose can report the use of illegal fireworks using the city's website.